Raleigh was supposed to receive a few inches of snow over the weekend, instead we received 47 snow flakes and 25 degree temperatures. The lack of snow play day was annoying, but the less than spring-like weather still allowed me to make soup! Oh, and shop for beach vacations…more on that one later. 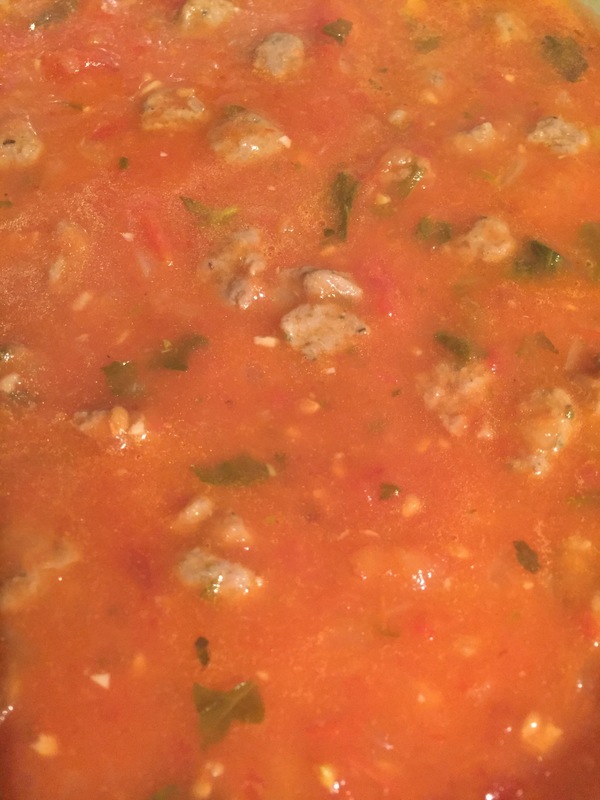 I decided my soup project while already in the grocery store, so I gave a quick google to see if someone had posted Chrissy Teigan’s tomato soup recipe online. Whoop! They had. I bought the ingredients and headed home to begin cooking. Howeverrrrrrrr, when I opened Cravings, to start my science, I found that the recipe was different from the online version. 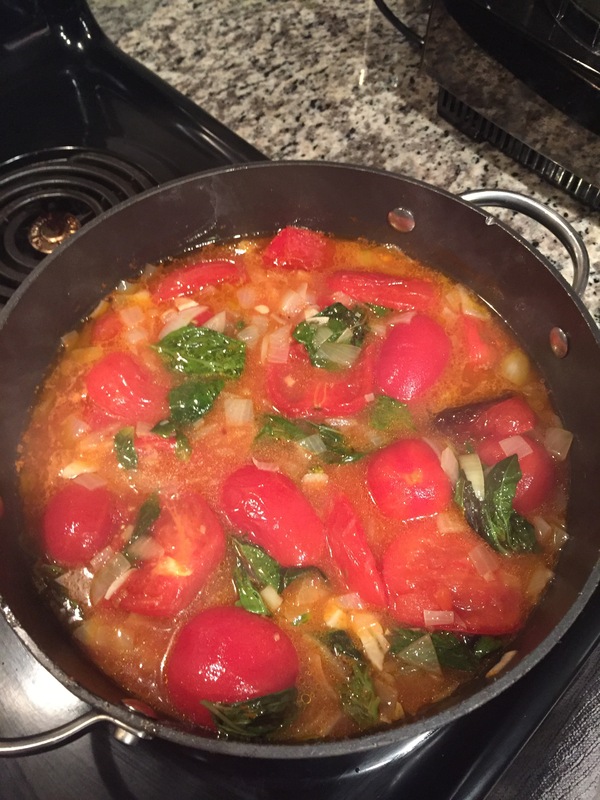 In numerous online articles, Chrissy touts Ina Garten’s roasted tomato soup recipe as fantastic. That is what I had shopped for and that is what I would be making. It was quite different than the recipe in her book and I was quite happy with the results. Ina never disappoints! A mix of fresh, roasted plum tomatoes hang out with canned tomatoes and a seemingly ludicrous amount of fresh basil. Here’s the finished product. It’s not pretty. That’s how you know something is awesome – when it gets posted on this site and the photo is a nightmare. Oh, and I added the ends of some crumbled turkey sausage that were taking up space in my fridge. Without further ado, here’s the recipe you need to be making for your family today. Healthy, hearty, and oh-so tomatoey. This is my new go-to tomato soup recipe. Toss together the cut, fresh tomatoes, 1/4 cup of the olive oil, and salt. Spread on baking pan with sides. In a stockpot, over medium heat, saute onion, garlic, olive oil, butter and red pepper flakes for about 10 minutes, until onion begins to brown. Add canned tomatoes (and their juice), basil, and chicken stock to the stockpot. Then add the oven-roasted tomatoes and juice from pan. Bring to a boil, then simmer uncovered for 40 minutes. Pass the soup through a food processor on the coarsest blade. (Soup will still be chunky). Cheekily toss crumbled turkey sausage, over shoulder and into pot.